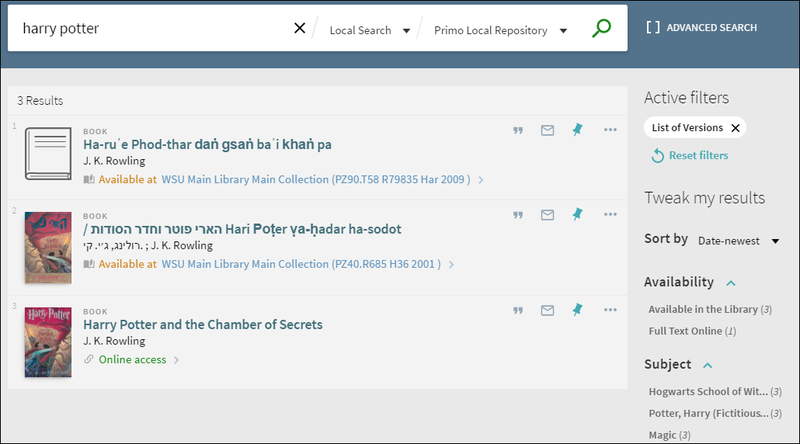 You can search very easily in Primo. Just type one or more words that you are looking for and click the Search button. If you enter multiple words, Primo will return results that contain all of the specified terms. Once you are familiar with the basic Primo search, you might want to try doing more with the Search panel or use the Advanced Search option (see Performing Advanced Searches). Both of these options offer numerous features for making your searches more precise and enable you to get results that are more useful. You may search for titles using ISBNs and ISSNs with or without hyphens. If you are not getting expected results with hyphens, please try your search again without hyphens. ( ) – Parentheses allow you to group search terms and alter the order of precedence. For more information, see Grouping Terms Within a Query. AND and NOT – left-to-right precedence is used in case of multiple operators. OR – left-to-right precedence is used in case of multiple operators. honey bee communication – Primo treats the entire query as a phrase and returns results in which all of the words may be closer together. honey bee AND communication – Primo treats honey bee and communication as separate phrases and returns results in which both phrases may not be as close together. For information on specifying exact phrases, see Searching for a Phrase. Primo assumes that you are searching for all of the words unless you type OR or NOT between words and phrases. For right-to-left languages (such as Hebrew), the precedence is right-to-left. To search for an exact phrase, type quotation marks around the phrase. You can combine both words and phrases in your search. If you search for words or phrases without specifying OR or NOT, Primo assumes that you are searching for all of the specified words or phrases. If parentheses are not used for a query that contains multiple operators, it is recommended that you use the NOT operator last to ensure that results are excluded from the entire query. For example: cycling AND safety NOT helmet. If it is necessary to place the NOT operator elsewhere, make sure that you enclose the operation with parentheses. For example: (cycling NOT safety) OR helmet.
? – enter a question mark to perform a single character wildcard search. For example, type wom?n to search for records that contain the strings woman, women, and so forth. * – enter an asterisk to perform a multiple character wildcard search. For example, type cultur* to search for records that contain strings, such as culture, cultural, and culturally. You can use parentheses to group terms to clarify the order of multiple operators specified in a query. After the results are returned, Primo will display the altered query in the search box so that you can decide whether to modify and re-execute your query to get expected results. The Advanced Search page allows you to create more complex searches by combining multiple search boxes, which are separated by an operator. Field selector – For each search box, this parameter allows you to narrow the search to all search fields or a particular field (such as title and subject). is (exact) – Returns results that contain phrases that exactly match the phrases specified in the query. contains – Returns results that contain all words in the phrase, but the words may be in a different order and may not be as close together. starts with – Returns results that contain words that start with the specified string. Operators – As with basic searches, you can include the following operators between words and phrases in each search box: AND, OR, and NOT. In addition, the Operator drop-down list allows you to select the operation that is used between search boxes. For more information on operator precedence, see Precedence Rules. If your query includes operators that separate phrases in which one or both of the phrases contain multiple words, Primo will use parentheses to group the words in each multiple-word phrase. For example, Primo will convert the query Donald Duck OR Disney to (Donald Duck) OR Disney to distinguish it from the following query: Donald (Duck OR Disney). Filters – Advanced searches allow you to apply various filters (such as material type and date ranges) to your initial queries. In the following example, matching records must contain either the words Donald and Duck or the words Mickey and Mouse in the title, and the subject of the records must not have the exact phrase Amusement Parks. From the matching records, only the English articles are displayed in the results. This section contains topics associated with your personal space and settings in Primo. Add items you found permanently to your Favorites. You can save items for future use. You should sign out of Primo so that your searches remain private and your personal settings and favorites are not tampered with by anyone else. My Library Card enables you to view the contents of your library card and perform library services, such as renewing a book or canceling a request. In addition, it lets you define your personal Primo settings. To access My Library Card, place your cursor over the Sign-In area at the top of any page to display the My Library Card link. You can tailor the Primo user interface so that it reflects the way you usually search. For example, you can specify the default language, the maximum numbers of search results per page, your default e-mail address, and your cell phone number. To set your preferences, click the Personal Details tab on the My Library Card page. The My Favorites page allows you to save items that you find during your Primo session. To access My Favorites, click the Pin icon at the top of the page. When you click the Unpinned icon for an item in the search results, the system highlights the item, changes the icon to the Pinned icon , and adds the item to the My Favorites page. You must sign in to save items for future sessions. To remove an item from the My Favorites page, click the Pinned icon next to the item in the search results or the My Favorites page. To view items that you have saved on the My Favorites page, click the Pin icon at the top of each page. From the list of items, click the item that you want to display. Resource Type – the format of the item, such as book, article, journal, and so forth. Title – Click the title to display more information and services for the item (see Brief Results Sections). Availability status – Click this link to display more information and services (such as requesting or viewing the item). Send to actions – The Send To actions allow you to perform actions on the item (such as emailing the item, creating a citation for the item, and so forth). Facets – The facets on the right side of the page allow you to filter your results by categories (such resource type and date) and to specify a type of sort. View Online – This section allows you to display an item that is available for online viewing. Get It – This section allows you to request physical items (such as books and audio CDs) from your institution. Depending on your institution, you may be able to request these items directly from Primo. Otherwise, this tab will link you to your institution to perform requests. You may have to sign in to Primo or your institution to make a request. Location Items – This section lists all of the locations that hold this item. To get more information on a location, click the location's link. Details – This section displays the item's full record, which includes details (such as the publisher and creation date). Links – This section displays additional links, which may allow you to view cover art, the Table of Contents, and so forth. More – This section displays links to full text services for journals, such as provided by the SFX link resolver.